Next week's Cloudscape VI event will feature a presentation on e-Science Central, a cloud-based platform for data analysis developed by researchers at Newcastle University, UK. Stephanie Parker speaks to two members of the e-Science Central team to find out more about both the platform and a new collaborative project they're working on called EU Brazil Cloud Connect. Simon Woodman (left) and Paul Watson (right). Front page image shows delegates at last year's Cloudscape V conference. Where did the idea for e-Science Central come from? PW: Back in 2009, we were working with researchers through the UK eScience program in the north-east. These researchers come from different backgrounds like chemistry and medicine and have different ways of working. But they have one thing in common: they are specialists in their domains, but are not IT specialists. The novel idea behind e-Science Central was to provide services to meet common requirements for a wider range of researchers. We saw cloud computing as a way of giving these researchers the computational resources they need, when they need them. Researchers can have a good idea on their way to work in the morning, and when they arrive immediately grab the computing resources they need to pursue it. e-Science Central is all about enabling researchers by unleashing the potential to shorten the time required to get from idea to realization, and so accelerate the rate at which science progresses. How has e-Science Central evolved to meet different user needs? SW: Back in the early days, we thought e-Science Central might be the Facebook for scientists from different disciplines. However, we came to realize that collaboration means very different things to different people, from sharing simple tools like calendars to sharing spectral data and analysis methods with colleagues distributed around the globe. Our users also include medical researchers analyzing therapeutic data gathered directly from patients. Another thing we've learned is that there is no one-size-fits-all solution, so we support different projects and researchers with installations that are specific to their needs. Today, we focus on providing technology that presents a familiar user interface to complex cloud technologies, can scale out to hundreds of cloud server instances, and can be used as a back-end data processing and analytics platform upon which to build custom applications. What national and European projects have you been involved in? PW: I direct a UK project called SiDE (Social Inclusion through the Digital Economy), exploring how advanced technologies can improve the lives of those from vulnerable groups, including older people, disabled people, and marginalized youths. This drives much of our work on cloud computing as SiDE makes heavy use of sensor-based systems which generate large amounts of data that must be analyzed in order to understand human behaviour, often in real-time. We're also involved in the UK NEXUS project on X-ray photoelectron spectroscopy, which is one of the principal methods of probing the composition and electronic structure of surfaces. At the European level, we played a dual role in the VENUS-C project, bringing about advances on the infrastructure side for e-Science Central and with a drug-discovery use case to validate our approach. Scalability was a key goal to ensure large volumes of data are scalable right across the system. SW: We've just started an exciting project with Brazil, EU Brazil Cloud Connect, coordinated by Ignacio Blanquer from Valencia University of Technology, Spain, and Francisco Brasileiro from the Federal University of Campina Grande, Brazil. This project is a great opportunity for us to foster closer collaboration with Brazilian research institutions. At Newcastle University we've already been involved in a number of common programs with Brazilian universities, including student exchange and research projects. However, EU Brazil Cloud Connect will be one of the largest research projects to date. For e-Science Central it's an excellent way of exploring how our system can be used for large-scale science across borders: big data with big resources. 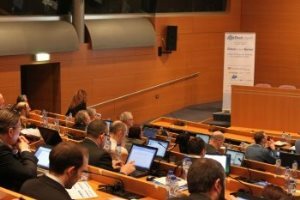 Finally, are you looking forward to attending next week's Cloudscape VI event in Brussels? SW: I will be presenting our work in a session on how cloud computing is being used to support science, from small research groups to large-scale international collaborations. Cloudscape will give us the invaluable opportunity to interact with other world leaders in cloud computing, form collaborations and discuss opportunities. Where else can you find so many experts from both industry and academia in one place? It is also a great platform for launching Cloudscape Brazil as part of EU Brazil Cloud Connect. Cloudscape VI will be held at the Microsoft Innovation Center Brussels, Belgium, on 24-25 February.